For some lucky people, office means waking up in the morning and sitting in the next home office room wherein for others, it means commuting to a place at a considerable distance away from home. In the recent times, urban driving has become a cumbersome activity. City motorists in the UK spend an average of six weeks each year behind the wheels commuting to and fro from their workplaces. Now if you thought these statistics was shocking, here is a list of the 5 cities in the world which offer the worst driving experience. There is no specific order of comparison, however the below cities have been selected based on the driving experience, the traffic laws adherence, the daily traffic situation during peak hours and the waiting time at the signals while the environmental attributes such as pollution were not considered. 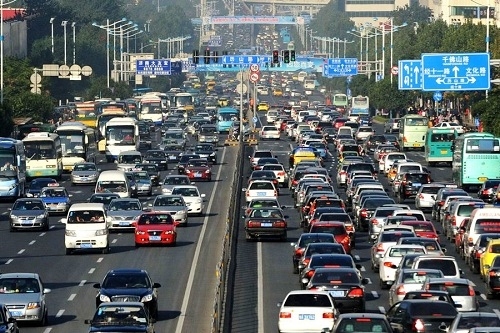 The capital city of China has been in the list of the worst driving places for a long time now. This notorious place has earned the name ‘Shoudu’, given by the natives which mean ‘the capital of traffic jams’. With over five million cars registered in the city, the flow of traffic is often sudden, random and congested. Beijing is notorious for the worst driving hazards. In 2010, the China National Highway Traffic Jam made it to the headlines when vehicles on the highway were stuck for days altogether. In 2015, the infamous traffic on the 50 lane G4 Beijing Honk Kong Macau expressway made news when a new check point caused numerous cars to merge in 20 lanes. Again, thousands of motorists were stuck in their vehicles for hours. China’s Transport Ministry later revealed that this was caused due the National Day festivities wherein about 750 million people were out on the roads. In Beijing, the worst driving conditions are made during festivals and bad weather. The current traffic scene is better, courtesy the numerous initiatives taken by the Government to curb traffic pangs such as setting out alternate days for car owners to take out their vehicles and introducing lottery system for procuring license plates for new cars. The city of dreams is one of the most populated cities in the country and being stuck in one signal to another is an everyday story for it’s residents. One of the biggest reasons for the worst driving experience is the lack of discipline is refraining from adhering to the traffic rules, whether it is overtaking from the left, accelerating through side streets without looking, disrespecting pavements, lane cutting or jumping traffic signals. The rising infrastructural development is giving rise to the number of private cars in leaps and bounds. Dug up roads and encroachment of pavements by the hawkers greatly restricts the smooth movement of vehicles. About a decade and a half ago, Mumbai was 1900 km in length which has only increased by 30 km today, as compared to the number of cars which is increasing by an average of 250 everyday. Such disproportions or road versus vehicles is greatly increasing the traffic density of Mumbai. The city of love has lately become a nuisance for the residents and tourists because of it’s increasing bad traffic conditions and it is advisable to not sit behind the wheels in Paris, if possible. Parking is one of the most difficult tasks with less parking space and more takers. Narrow streets, too many traffic roundabouts and absence of proper lane markings makes it difficult for the drivers to manoeuvre, leading them to take sporadic and sudden turns. The huge roundabout at the Arc De Triomphe, one of the most famous monuments in Paris, itself has approximately 13 various entrances with no proper lane markings or directions making the place one of the worst driving destinations. In the past decade, numerous research and effective measures have been adopted to make the driving conditions better in the city, such as the introductions of Intelligent Transport Systems technology. The capital city for Italy is a driving mayhem where seatbelts and rear view mirrors are simply accessories. The Roman rental car drivers face innumerable driving hazards such as tailgating and road raging. Tailgating seems to be a favourite pastime of the motorists in Rome. The city witnesses numerous car crashes on a daily basis. The experienced drivers maintain their individual road guidelines as against the ones laid down by rule, thereby enhancing the worst driving experience for those who intend to adhere to the traffic rules. It is said that a new driver has to unlearn everything before he sits behind the wheels in Rome. Thankfully the city does not allow visitors to drive in most parts of it, which is referred to as ‘Zona a traffic limitato’. If you had an innate desire of driving down the picturesque Italy, you may well rent a car to relive your dream on the Italian countryside. Rome is definitely not the place to realize this. The busiest and the most congested highway of North America, the 401 is home to this city. Even though the Toronto stretch of this highway is about 18 lanes wide, during peak hours the traffic comes to a standstill. About a half a million people commute through the 401 highway on a daily basis. The road can be tedious and difficult to manoeuvre for drivers who are not aware of the driving rules as certain regulations such as passing on the right is accepted by law. Of the numerous beautiful experience that Toronto has in store for it’s residents and visitors, a good driving experience is definitely not one of them. When it comes to enforcing road rules, not every country is alike. People driving in Europe might become hassled with the uncountable roundabouts and mostly one way roads which lead nowhere. Also road hazards differ from city to city, given the commercial importance, population and the geographical structure of the place. However, building wide motorways, providing detailed road markings and laying down strict driving guidelines are some of the basic principles of combating worse to worst driving habits.